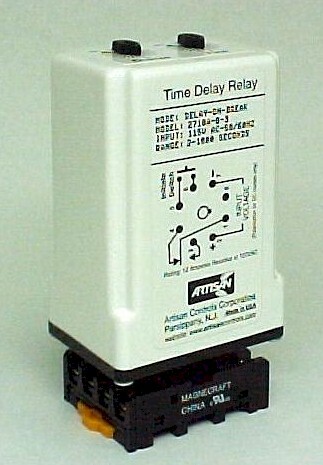 The 2710 is a Delay-On-Break timer controlling a SPDT set of relay contacts. The 2710 is available in a range of both AC and DC models. With operating voltage applied, the timer is in a stand-by mode. Closure of the INITIATE switch causes the output contacts to energize and remain energized until a preset timing period after the INITIATE switch opens. Re-closure of the INITIATE switch during timing resets the timer, keeping the output energized. Purchase Tolerance Low time 0%, -50%, High time -0%, 30%. Example - Timing range -3, (2 - 1000 seconds), can range from 1 to 1300 seconds, with 2 - 1000 seconds as a guaranteed minimum range.